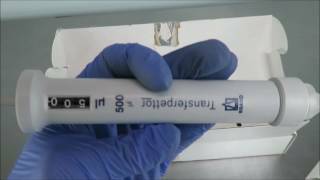 The Transferpettor 500ul Pipette uses positive displacement to work with liquids that make traditional air-displacement pipettes in effective. Viscous liquids up to 0,000cSt (mm/s) as well as high density media up to 13.6g/cm3 like concentrated protein solutions, glycerin, resins, oils and fats. The transferpettor is also a great solution for surfactants and high pressure media up to 500mBar. This single channel pipette is ideal for applications in wineries, breweries, refineries, biochemical genetics, even wastewater treatment plants and many more. The piston of this pipetter wipes the walls of the dispenser clean as it expels the media from tip, giving users highly accurate results, even with the most challenging of liquids. This minimal wetting means you can save money on consumables by eliminating the need to refresh tips with each use. This Transferpettor 500ul Pipette is brand new in the box and comes with all of it's paperwork. All of our lab equipment comes backed with our standard warranty. Should you have any questions please don't hesitate to contact us.